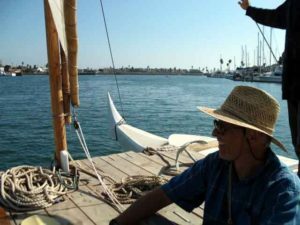 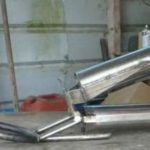 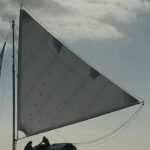 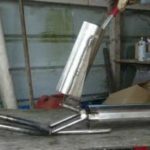 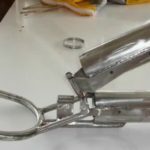 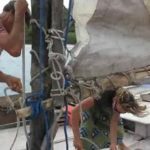 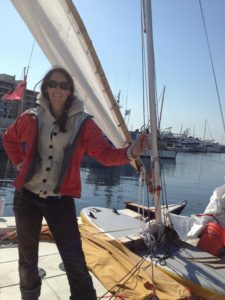 A key question in the design of a crab claw sail and rig for your sailboat is whether to fix the tack of the sail aft of the mast, or to let it go forward of the mast. 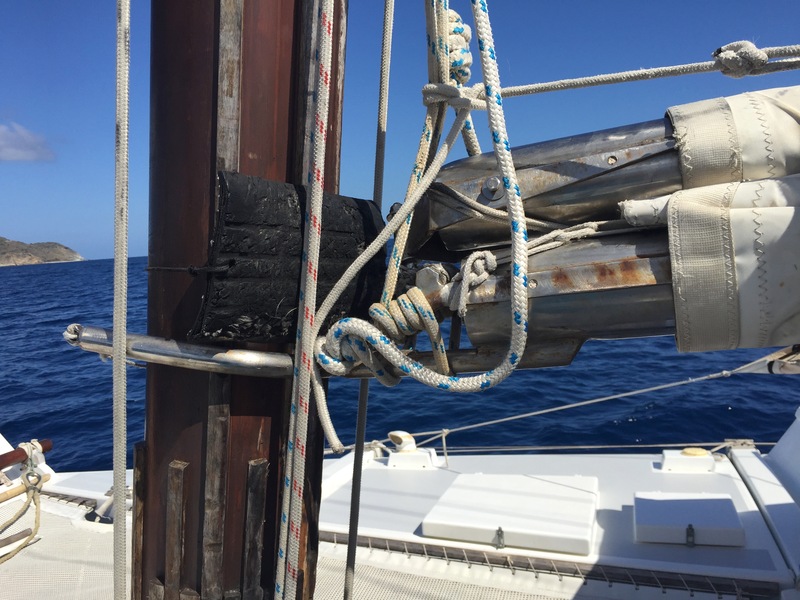 The advantage of fixing the tack aft of the mast (e.g. 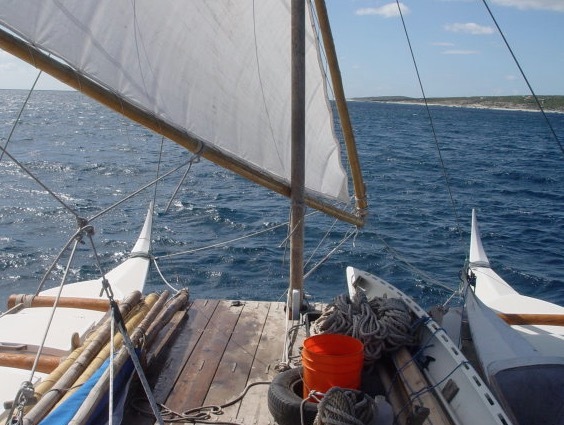 with a yoke) is that one doesn’t need to move the sail and spars to the leeward side of the mast each time you tack. 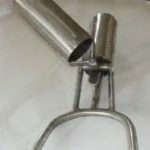 There is also no longer a need for a snotter, so you have one less control line. 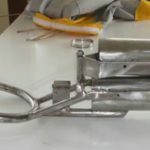 The disadvantage is that you have to engineer a yoke at the forward end of the lower spar and then decide how the upper spar is going to be attached. Over spring break (2016) we had the pleasure of cruising aboard Wakataitea, a Tiki 46 now owned by Mike and Catherine. 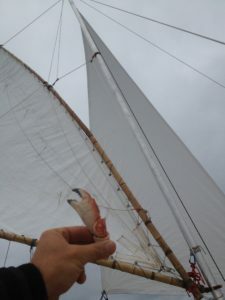 It was a treat in part because I’d never been up close and personal with such a large crab claw sail. 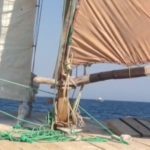 With spars 10.5 meters long, a 10m leech, and a total area of 45 square meters, Wakataitea’s main sail is 2x bigger than the biggest crab claw I’ve constructed and sailed. 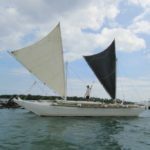 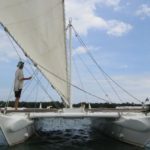 After struggling to get the right combination of size, spar stiffness, and fore/aft positioning of the center of effort with the 20 m^2 crab claw on the Hitia 17 in the 2015 Race to Alaska, I was eager to see how Hans had built Wakataitea’s main. 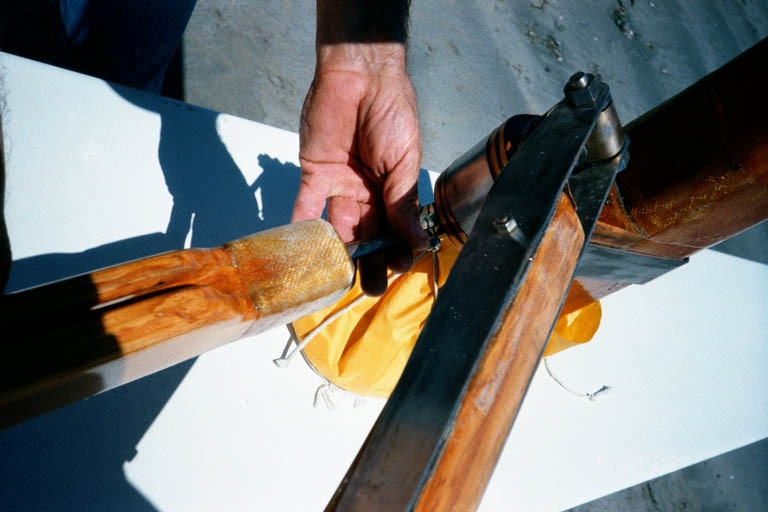 He laminated his spars with yellow cedar with a layer of biaxial fiberglass sandwiched in the middle. 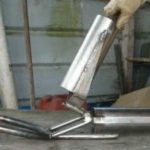 They 100 mm in diameter with a round cross-section. 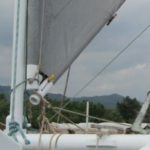 The sail is sleeved over the spars with gaps for the halyard and mainsheet connections. The tack is held just aft of the mainmast with a stainless steel yoke-hinge welded up by Hans. I had admired these “jaws” a few years ago when I was rigging a 13 m^2 crab claw on our Tiki 21 Milagra. 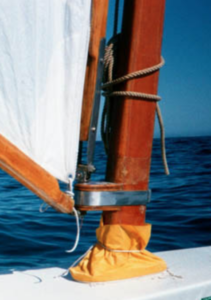 Hans seemed to have the right idea: a yoke to fit the mast and a 2-D hinge that would both allow the spars to close together parallel when the sail was struck, or open fully with the upper spar either parallel to the mast, or offset to leeward if the halyard was less than 2-blocked. 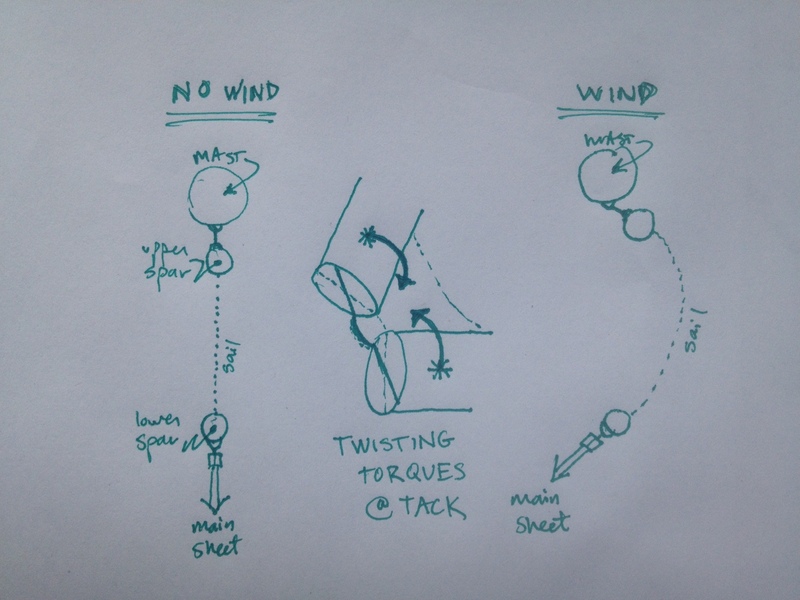 What causes these twisting torques is a great question! 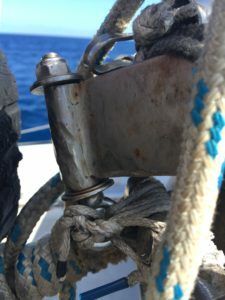 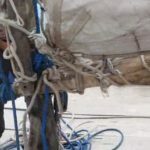 I suspect it has to do with the fact that the halyard and mainsheet are attached at fixed points: on the upper side of the upper spar and lower side of the lower spar, respectively. 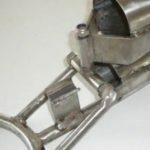 If we can’t fully get rid of the twisting torques, what we really need is a 3-D or universal joint where the two spars meet the yoke. 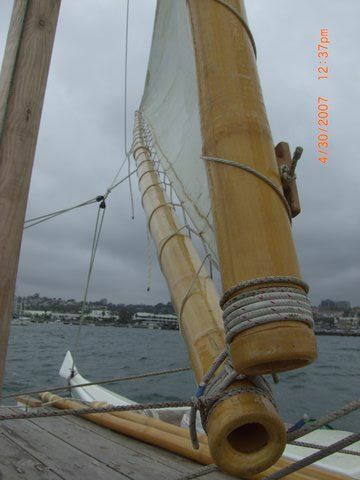 On the Tiki 21, I accomplished this (mostly) by lashing the bamboo spars side by side. 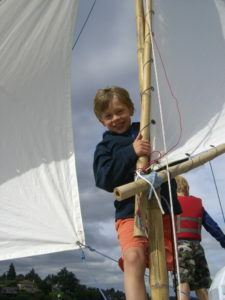 The twisting torques still turned the yoke, but the play between the yoke and the mast usually could accommodate them. 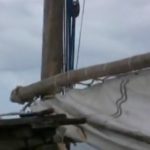 Here the tack is formed by lashing the bamboo together and tying the tails of the lashing around the mast. 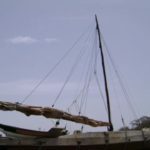 In this version, the lower spar is extended past the mast with a snotter attached so that the upper spar can be hauled aft of the mast. 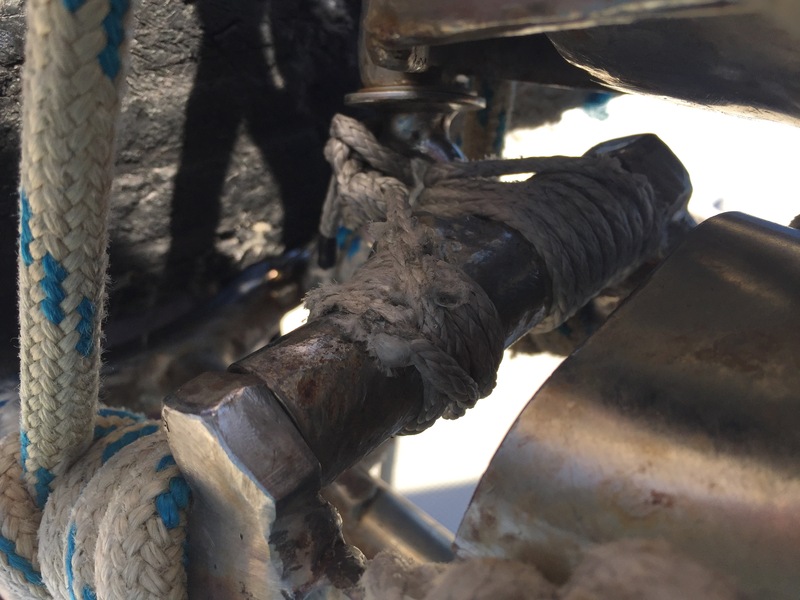 Finally, we’ve glued a madrona yoke into the end of the lower spar and are hauling it up with a 2:1 system attached to the mast with a set of constrictor knots. 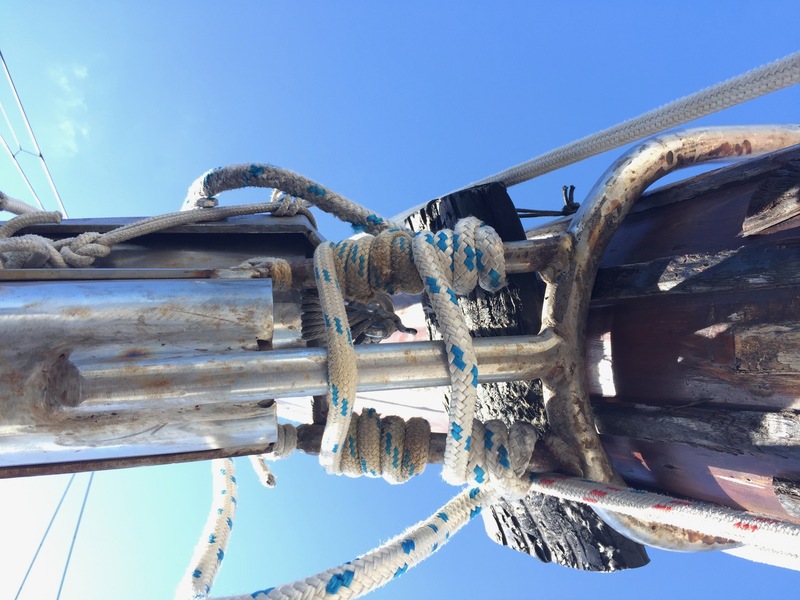 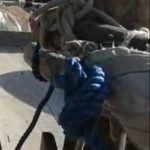 … and are trying to stabilize the tack against the mast with a snotter that pulls it up and the snotter tails quasi-lashing the end of the lower spar to the mast! 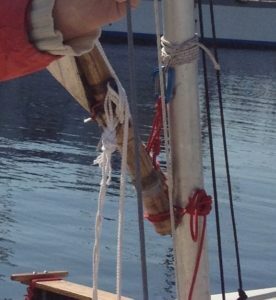 The yoke has increased the separation between the upper spar and the mast. 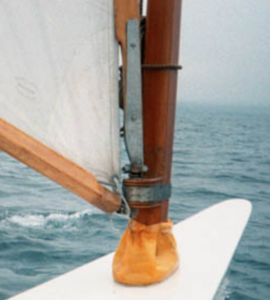 The snotter is effectively a fixed line, though it can be used to raise or lower the tack (useful for adjusting the peak of a deck tent). This combination of a lashing to connect the two spars and a yoke/snotter to connect the tack and the mast seems to work pretty well. 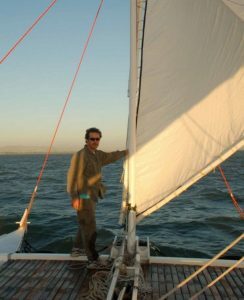 The first yoke we tried, made from a forked madrona branch lasted a couple seasons, but eventually broke with a BANG during a downwind run in ~20-30 knots — I think by a combination of twisting torque and forward force. 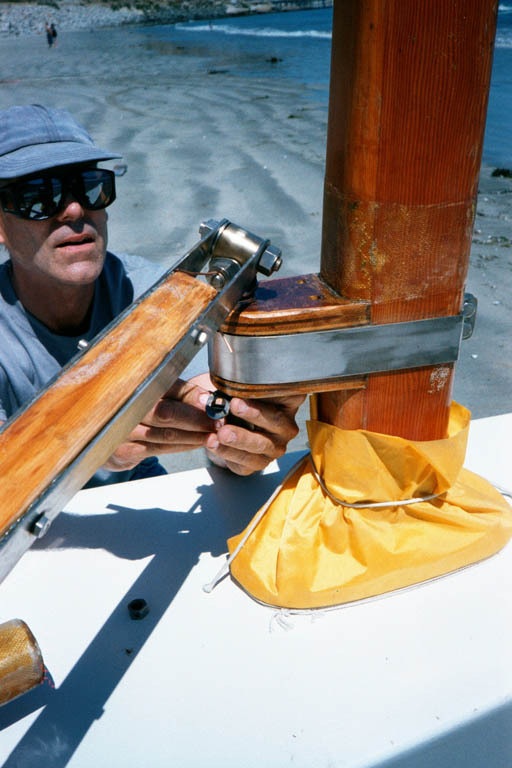 A new yoke fabricated out of 5/8″ teak planks has lasted 5 seasons so far. 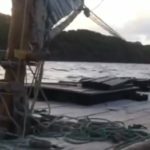 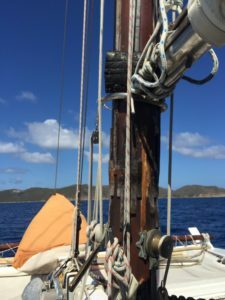 The hardwood was able to take the stress without breaking (though in high winds the teak got slightly crushed where it made contact with the aluminum mast). 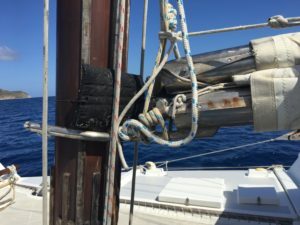 An improvement to our system might be to allow the yoke to rotate within the lower spar, thus preventing the twisting torques on the lower spar from causing the yoke to come out of orthogonal alignment with the mast. 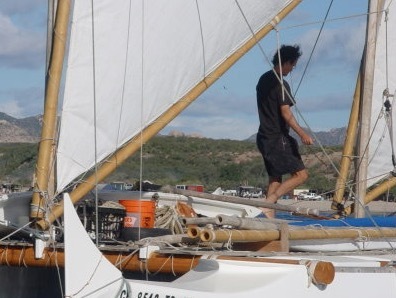 Glenn has a slightly different solution on Manulele. 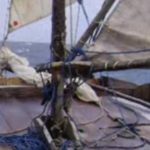 His foresail tack appears to be held together with a lashing line (threaded through a hole in the upper spar?) 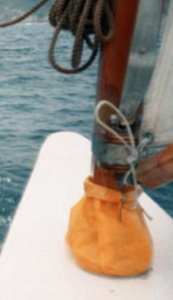 and held aft by (double?) 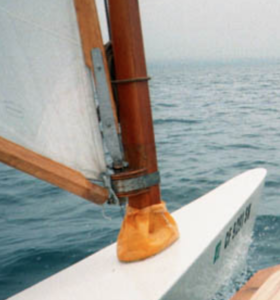 snotter lines that run aft from the lower spar at the tack. 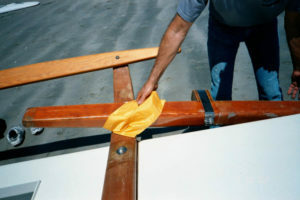 This has the advantage of not needing a yoke, but the disadvantage of adding tripping hazards. 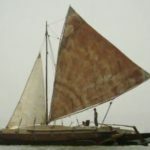 The main sail seems to port of its mast. 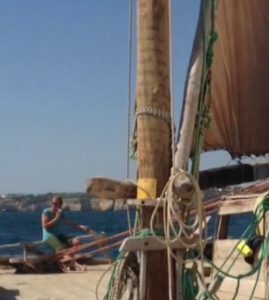 The foresail tack is also slightly to port, but here you can see it is held aft by snotter(s). 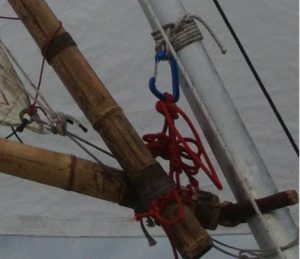 In other iterations (2 photos below from Wharram site) have bamboo spars lashed together and a suite of snotters (4 of them?) 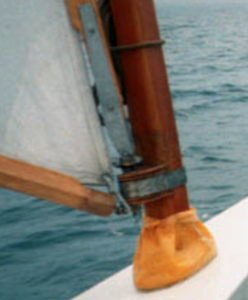 that appear to be able to haul the tack aft and/or outboard towards the bows. Manurere foreclaw tack furled by Kim Whitmyer. 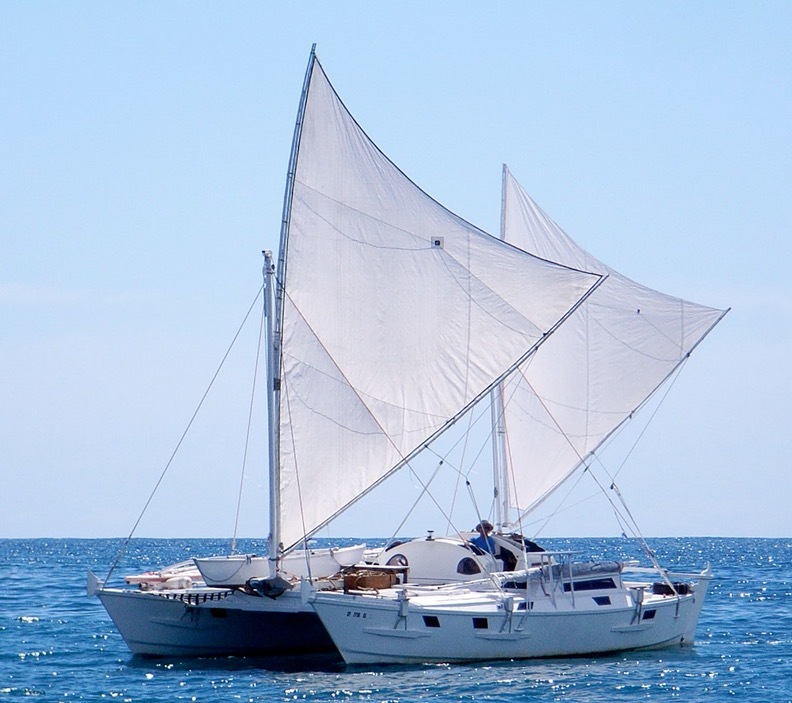 Manurere crab claw tack sailing by Kim Whitmyer. 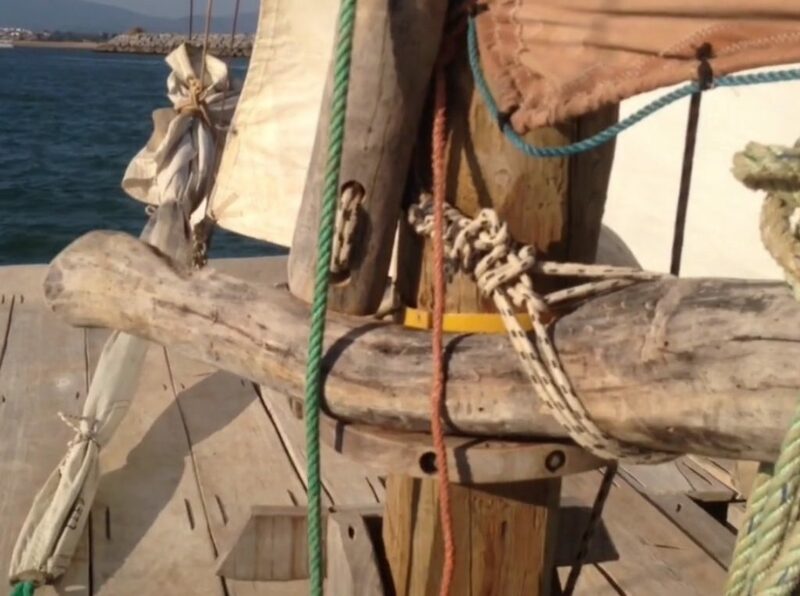 It appears that he’s used a symmetrical fork in a large tree as the yoke and the lower spar! 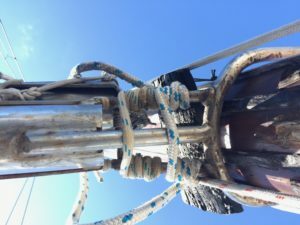 This yoke rests on a hoop afixed to the mast and is also supported by a line that runs up and around the mast (sort of like a snotter, but easily adjustable). 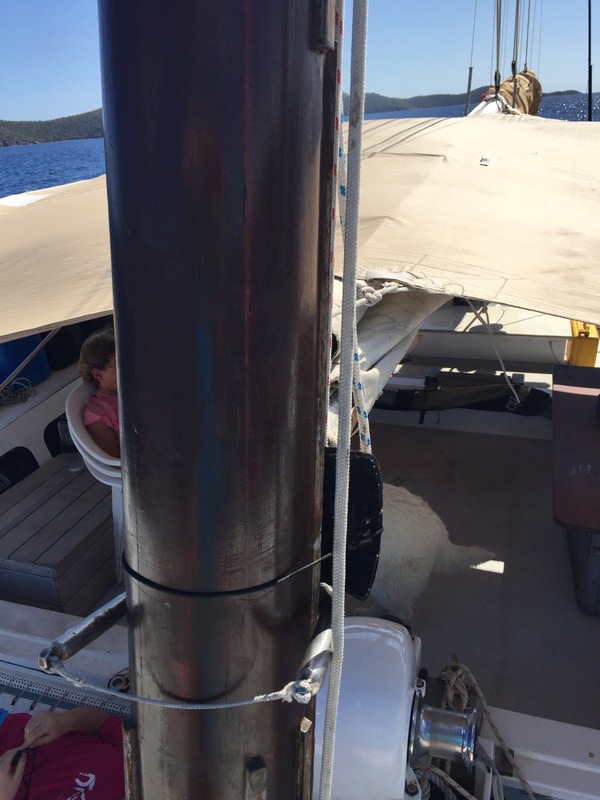 The upper spar comes down on one side of the mast and is also attached to the line that runs around the mast. 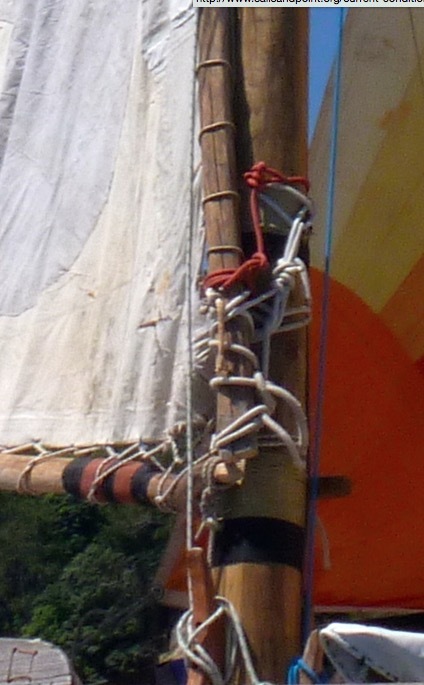 Notice the B&W line lashed around the mast which has clearly experienced a lot of downward force on the aft-port side. 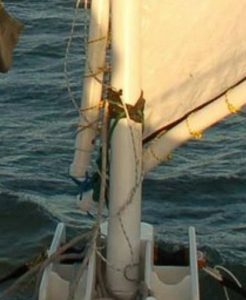 And lastly, here’s a shot from Jan 2013 that shows slight revisions to Klaar’s tack-yoke system, now on the “Mareva” (re-named from Ontong Java). 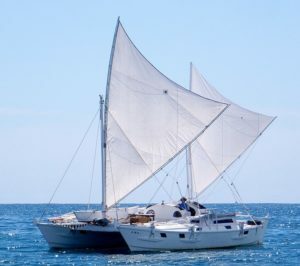 Problem is the boom (lower spar) needs to be able to rotate left and right depending on which tack you are on (sail pulls out on top, sheet pulls in on bottom). On Aluna the yard is attached with a rope to the mast, while the boom is tied aft, the two spars also connected by rope. Like that the tack is suspended and doesn’t touch the mast, neither does the yard, also solving the problem of chafe. 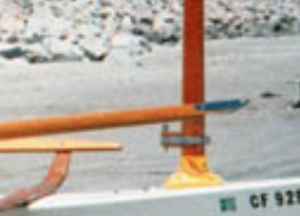 Does anyone have a close-up of this more recent configuration? 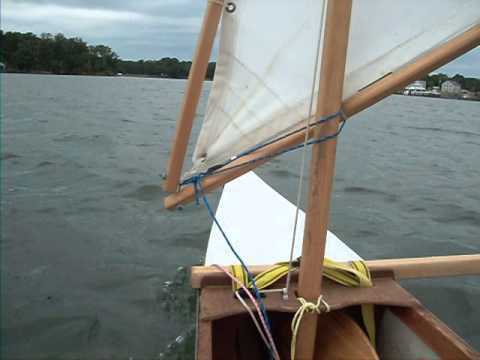 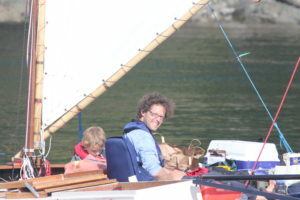 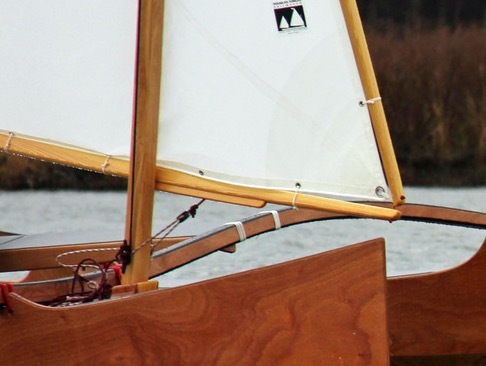 Though they allow that tack to go forward of the mast (and have a 2:1 snotter), the Outrigger Junior spars are connected with a simple line, similar to what Beat describes. It’s rare to see detail photos of Malibu Outriggers (tacking proa of 1950s southern California), but Tim Anderson got a few that show an intriguing use of wood and metal to provide a rigid connection between the crab-claw spars and the base of the stub mast. Malibu Outrigger crab claw sail spar-mast connection (photo by Tim Anderson). Malibu Outrigger crab claw sail upper spar-mast connection (photo by Tim Anderson). Malibu Outrigger crab claw sail lower spar-mast connection (photo by Tim Anderson). 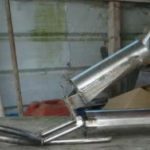 Other evolutions? 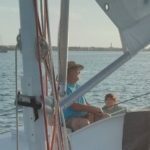 List them in the comments and I’ll revise this post accordingly!